Dr. Peter A. Karth, MD, MBA specializes treatment and management of retina and vitreous disease. In his clinic, Dr. Karth and his team provide cutting-edge patient care and the unparalleled patient experience in the diagnosis and treatment of macular degeneration (AMD), eye disease from diabetes, retinal vascular occlusions and all retinal conditions. Surgically, his focus is minimally invasive small incision sutureless and painless retinal surgery for delicate retinal pathologies such as macular holes, epiretinal membranes, macular pucker, as well as complex retinal detachments and surgical diabetic disease, Dr. Karth leverages his experience to focus on successful outcomes and a superior patient experience at every step. Dr. Peter Karth is happy to offer an ultra low risk and complete solution for removal bothersome eye floaters. Dr. Peter Karth has been trained at several of the leading ophthalmology centers in the USA, including Stanford University. Dr. Karth also held faculty positions at Stanford University as an Assistant Clinical Professor and Adjunct Assistant Clinical Professor. Click to read this very positive endorsement of Dr. Karth, from Jeff Goldberg MD, Chairman of the Stanford University Department of Ophthalmology. Thanks for your kind words and support, Jeff! Wood EH, Karth PA, Sanislo SR, Moshfeghi DM, Palanker DV. Nondamaging Retinal Therapy for Treatment of Central Serous Chorioretinopathy What is the Evidence? Retina. 2017 Jun;37(6):1021-1033. PA Karth. Here Come the Machines: Progress or Replacing MDs? Ophthalmology Times May 2017. PA Karth, E Raimy. Machine Learning for Diabetic Retinopathy. Review of Ophthalmology May 2017. PA Karth (interview), by L Hillman. Google’s artificial intelligence program detects diabetic retinopathy. EyeWorld March 2017. Ophthalmology. Preventing progression in early age-related macular degeneration with sub-threshold laser therapy: A Systematic Review for Ophthalmology. Ophthalmology Times Europe. Here Come the Machines: Opportunity or Threat. Ophthalmology Times Europe. Review and Update of Macular Telangiectasia. Peter A. Karth, MD, MBA is a board-certified ophthalmologist and vitreoretinal physician and surgeon. Dr. Karth has had excellent training and extensive experience in ophthalmologic and retinal disease and surgery. He completed his Vitreoretinal Fellowship training at Stanford University, and subsequently joined the clinical faculty as an Assistant Clinical Professor, as well as serving on the teaching faculty at the Byers Eye Institute at Stanford University as a Adjunct Assistant Clinical Professor. He previously completed his surgically intense ophthalmology residency at Medical College of Wisconsin. Dr. Karth attended University of Illinois at Chicago for medical school, while concurrently completing his MBA degree at the University of Chicago Booth School of Business. 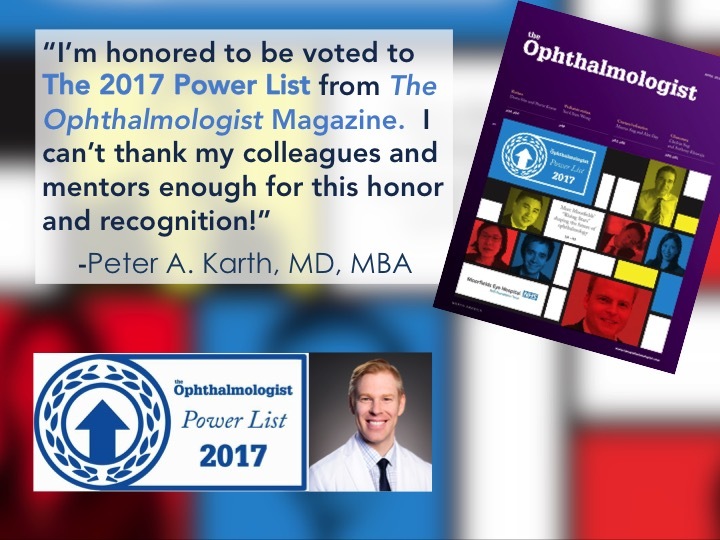 Dr. Peter Karth has contributed to many popular and peer-reviewed ophthalmic publications and has given many research presentations at national and international conferences. He consults for Silicon Valley's most prestigious tech firms, including Google and Apple. Dr Karth is interested in medical device/drug innovation. Above all else, Dr. Peter Karth is a devoted clinician and surgeon. Focusing on minimally invasive small incision sutureless and painless surgery for delicate procedures such as floaters removal, macular holes, epiretinal membranes and macular pucker, Dr. Karth leverages his experience to focus on successful outcomes and a superior patient experience at every step. In the clinic, Dr. Karth and his team provide cutting-edge patient care and the unparalleled patient experience in the diagnosis and treatment of macular degeneration, diabetic eye disease and retinal vascular occlusions. Dr. Karth has implemented clinic standards to reduce patient wait times, improve outcomes, provide vision-saving care to all his patients. Dr. Karth graduated from the world famous Stanford BioDesign Fellowship Program in 2016 as a Stanford Faculty Member. Dr. Karth continues to be very active in biodesign and medical innovation. Dr. Karth is very active in the ophthalmic and retina community, locally, nationally, and internationally. Editorial Board member of AAO EyeWiki Retina, EC Ophthalmology, SRL Ophthalmology.